We have a service-based application which has both internal (intranet) and external (internet) customers. We want to expose a secure WCF service for this application using appropriate and effective protocols based on the kind of connection. Well that’s a total non-starter. Since we have external users, we support custom username/password authentication. The server’s behavior is tightly integrating with the user’s identity, which must be known. Furthermore, the idea of transporting messages completely in the open between the router and primary server was also not appealing. We could enable this message transport by re-attaching the client’s credentials at the router, however, this would require loading the primary server’s private key certificate on the router server (which is a DMZ server). Neither secure nor appealing. The solution was to use our NetScaler DMZ device to accept HTTP connections and forward them to an HTTP WCF endpoint on the primary server. Encryption is delegated to the message level, using a certificate, with authentication handled by username/password also at the message level. The client (whether internal or external) encrypts and signs the message with the server’s public key certificate. The private key only exists on the server. Thus, the communication is secure at all points. In order to ensure no lapses in security implementation occur, we can set the “EncryptAndSign” protection level on the service interface. This ensures that the service will reject any circumstance in which the message is not encrypted. Since the requests will be forwarded from the NetScaler, the URL that the client requests will not match the actual answering host. By default, WCF will reject connections of this type. It is necessary to modify the service behavior to disable address filtering. In order to implement this technique, we relieve the WCF service of any transport-level security. Although external transport level security (HTTPS) can be provided by the NetScaler, this interferes with WCF (it wants to either encrypt the message, or transport, but not both; since the HTTPS is stripped off, that won’t work). 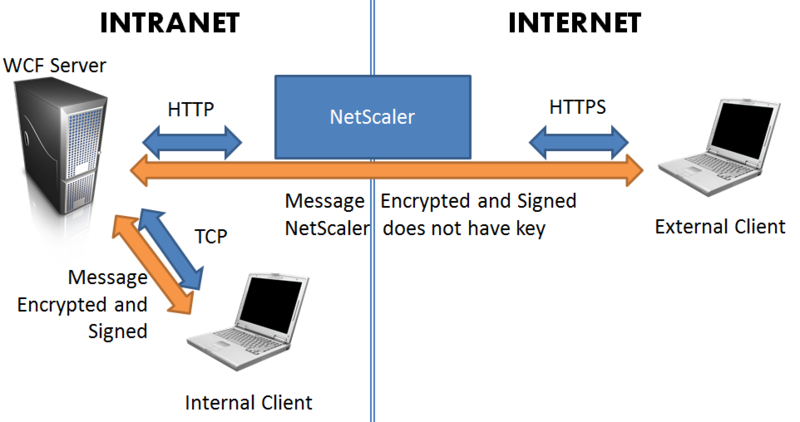 All WCF security (encryption and signing) will be provided at the message level, which can then be passed without inspection by the NetScaler. We then configure the two server endpoints (HTTP, which will come from the NetScaler and external connections, and Net.TCP, which will be faster for internal connections) to both require message security. Although message security is slower than transport security, WCF cannot provided consistent transport security in these scenarios given that we don’t wish to expose the private key on an externally facing server, which would be necessary to perform the encryption at the transport level. Even though “UserName” is the credential type, a certificate will still be required for encryption. You will need to generate and apply a certificate. We load the certificate in code, and use a custom certificate and certificate validator to ensure the thumbprint matches. Where “Certificate” is an instance of a certificate validator class (X509CertificateValidator) which loads the public key of the certificate and compares the thumbprint of the presented certificate to the local certificate. This prohibits “man in the middle” type attacks by forcing one specific certificate (whose private key exists only on the primary server) to be used for encryption. Together with a client username/password, mutual authentication is assured. The server is thus authenticated to the client with this certificate, and the client is authenticated to the server with a username/password. This architecture grants end-to-end security for both intranet and external customers without exposure of keys or dangerous “en route” decryption/re-encryption. This entry was posted in WCF by steven777400. Bookmark the permalink. This is a real issue with a lot of the OFM apps. Good read, now I need to google some of the language.